Cats! Always independent little fellers aren't they? Lilou the cat ran away from her home in suburban Ireland by boarding a train headed to Dublin. I imagine she was going out for a few pints with her mates. 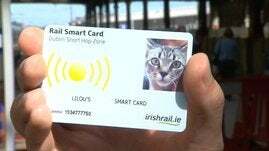 Lilou, the renegade cat she is, was caught on video skipping the fare at a suburban station in Ireland. City workers used surveillance footage to determine what station she got on so that they could tweet her story in hopes of finding her owner. Luckily it worked! Lilou was reunited with her owner and it felt so good (to be honest, she doesn't look the least bit happy in the picture above).